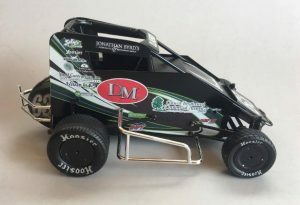 It’s arrived, my Bryan Clauson handmade midget model | Talking Speedway, Speedway news from around the world! We all have our favourite Speedway driver and mine is Bryan Clauson. Sadly last August Speedway lost this wonderful young racer as a result of an accident in his #63 Midget race car at the Belleville Midget Nationals. Heart break was felt around the Speedway World and the devastating effect on his family trying recovering from this tragic loss is only softened by the memories of his selfless actions in being an organ donor. Today I have unpacked the handmade die cast of Bryan’s #63 and must admit to a fair bit of emotion as I slowly and carefully unpacked the parcel.Beautifully crafted by John Stewart of Retro Racing Custom Model Cars, it now sits proudly with my other speddway model collections .I had the pleasure of meeting Bryan in 2013 at Lismore Speedway during a POWRi World Midget Show, short chat during a break in the pits, meeting Bryan is something I will always remember and cherish. You can honor Bryan’s memory and help many other families by discussing with your family your wish to be an organ donor. This is a wonderful thing to do. Thanks John Stewart Retro Racing Custom Models the model has arrived and is truly fantastic, great craftsmanship. 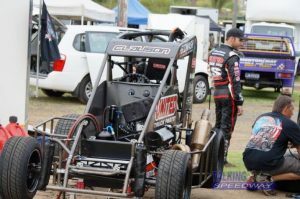 This entry was posted in Midget Speedcars, Powri World Midget Championship, USAC Midgets by admin. Bookmark the permalink.